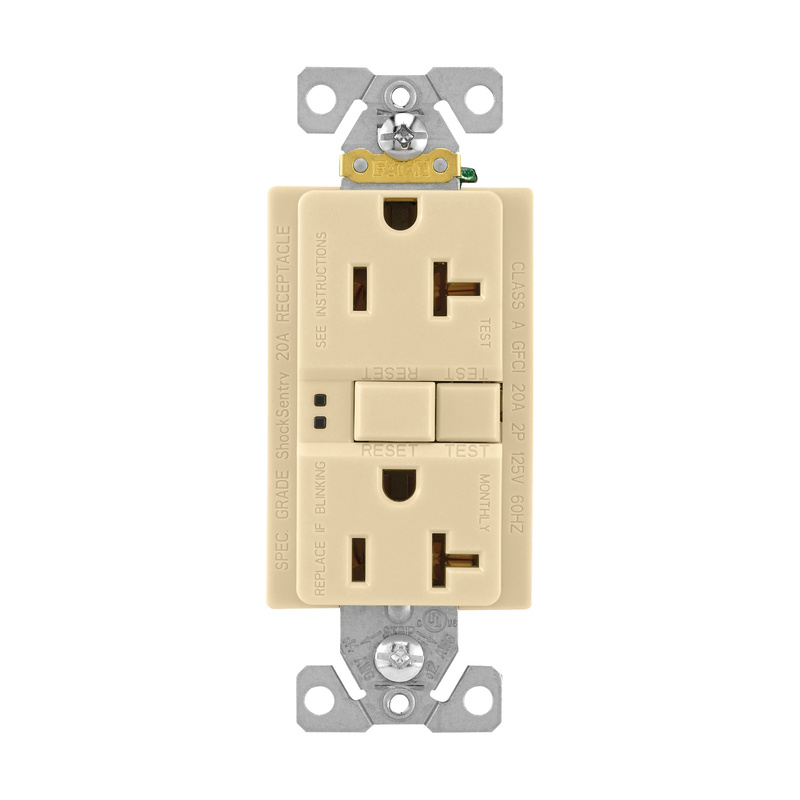 Cooper Wiring Device ShockSentry™ Arrow Hart® 2-Pole 3-Wire Self-test GFCI duplex receptacle in ivory color, has voltage rating of 125-Volt AC and current rating of 20-Amps at 60-Hz. It has short-circuit current rating of 10-Kilo-Amps. The specification grade receptacle accommodates #14 - #10-AWG conductor. It features back and side wired terminal connection for easy installation. It has polypropylene top housing and PVC bottom housing. It measures 4.2-Inch x 1.68-Inch x 1.27-Inch. The receptacle withstands dielectric strength of 2000-Volts. It has brass contact for optimal conductivity and zinc-plated steel strap. It withstands temperature range of -35 to 66 deg C.
The automatic receptacle has NEMA 5-20R configuration. It has V-2 per UL94 flammability rating to withstand harsh environmental conditions. It has automatic grounding system that avoids the requirement for bonding jumper in grounded metal enclosure. It has tamper-resistant shutter that prevents insertion of foreign objects. Self-test GFCI duplex receptacle is UL listed, CSA certified and meets NEC standards.